I know a child named Jaylen. He has dark skin and comes from a home that is much different than mine and he attends my church each week. On Sundays and Wednesdays, Jaylen stands in a sea of faces that look much different than his, but he belongs just as much as anyone else. He never says a word about the differences he has. There are other children and teenagers that come from his neighborhood with him to church. They, too, have dark skin and come from places deemed “bad” or “dangerous” by outsiders who do not really know the faces and the personalities of these people that I have come to know in just a few short months. These faces are just as precious as all the rest in the crowd, and these personalities are spectacular. I can feel God breaking through barriers in the way that these children feel a sense of belonging at church, and I know that it is a sanctuary of safety and love. Being different from the majority does not seem to phase them enough to deter them from feeling loved. Instead, they join in with everyone else, learning the different parts of the biblical narrative, reaching out to others, worshiping with friends and making music with all kinds of instruments. Skin color does not matter. The song, quoted at the beginning of this post, is one that most people who grew up in church likely know. The words are true and they are still relevant today. Just as Jesus loves the little children–red, brown, yellow, black and white–aren’t we called to do the same? Ever since I was fourteen, I have been more aware of race relations and the tensions that race can cause. My awareness of such increased when my aunt and uncle adopted a precious boy from Ethiopia. He, too, has dark skin like Jaylen. On the outside, he looks nothing like his mom and dad. However, his heart rhythm is very much in sync with their heart rhythms. They, two American, white people, are the only parents he has ever known. His race does not stop him from the life that he has. The love he feels from his parents surpasses the differences. His parents should never have to worry about his safety in this world because of the color of his skin. His heritage is important, just as Jaylen’s is; but heritage is only part of a person and only a piece of life’s chapters. While I know that race relations and the tension that comes from those relations is something very prevalent throughout the world today (even in places close to home), there are places where that tension is being erased through the power of love. Relationships that are rooted in the love of Christ, no matter the color, are able to reach over boundaries that should never have been boundaries at all. In Jaylen’s life, his dark skin is a part of who he is and who he will always be, but his skin color is not all that he is and all that he will be. Jaylen is a boy filled with emotion; his feelings become easily hurt after an unkind word from a friend. He loves dipping french fries in a vanilla Frosty. He has an affinity for double servings of chocolate covered donuts and eats them with the voracity of a tiger. His crooked smile is sweet and contagious, and he can lay down a beat on a table like nobody’s business. 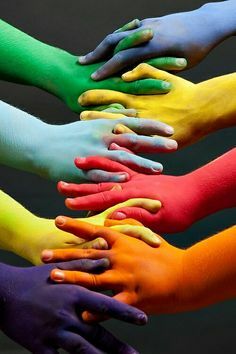 None of this has to do with the color of his skin–it is part of being a unique creation. While we are all different, thank goodness, we are all made in the image of God. In a recent conversation with a colleague, we discussed the issue of racism in the modern world and the ways it affects different generations of people from different contexts. I do think that the issue of racism has generational and, of course, contextual implications. However, I also believe that it is something that people from all generations and contexts need to work to change for the good of all. Being from a certain generation or context is no excuse for staying glued to one ideology and mindset. I am still learning and growing in my understanding of race relations and privilege. Over time, I have realized that I live in a small, sheltered box and that my awareness of the vast world needs to increase. In order to understand others and bridge divides, I must climb out of my box and meet the people and the families behind the faces I see as I pass, start conversations with those that are different than me and seek understanding, sowing love wherever God leads me. Relationships between those with differences are catalysts for the kind of change we need to see in the world. Children, I have found, are the purest examples of extending grace and abolishing barriers that hold so many others back. Jaylen celebrates in worship and fellowship with people who live much different lives, and he is a member of the family of God. My cousin has a family that shares no genetic or biological ties, but he certainly belongs to this family and calls these people his own. None of the differences that seem so big even matter. We are all chosen by God to love and to accept and to make peace in this world when peace seems so far away. May you sow peace wherever you are and get to know someone who is different than you. Mallory Monroe is a third year divinity school student at Gardner-Webb University and also works as a Minister to Children in her hometown of Shelby, North Carolina.